This magnificent Mainship is in as new condition. With great walk around decks, comfortable modern living area, Island bed and second double cabin. Great open space saloon, modern galley with draw fridge/freezer, and beautifully appointed leather saloon. Clean and tidy engine room, easy stairs to a comfortable expansive flybridge area, duel helm stations, modern electronics, new clears, bow and stern thrusters. Just a great user friendly vessel. 380 Hp Shaft drive Fresh water cooled, in excellent condition. At 2200 rpm it does 8 - 10 knts using 17 lts an hour. 946 L stainless steel tank. Port side galley beautifully fitted out with modern fittings, Corean bench tops, 2 burner electric hot plates, Panasonic microwave, Vitrifrigo upright draw fridge freezer, heaps of clever cupboard spaces, single round sink with flip mixer, hot and cold water, soft leather galley seating for 6. Vitrifrigo Draw fridge and freezer, Flybridge 40 L bar fridge. 12v and 240 V.
Draw freezer and ice maker in flybridge. Comfortable island bed in V berth, with hanging and cupboards spaces, Port cabin has double bed with hanging space. Dinette folds down to double and sofa pulls out to double bed. Beautifully appointed bath room with separate shower. Electric vacuum flush part of a beautiful appointed bath room. Fusion wide screen TV with DVD, Sony Stereo system with USB connection. Saloon and forward cabins air conditioned. Sirocco Inflatable with aluminium bottom. Lewmar electric winch with up and down controls at both helms, CQR anchor, chain and heaps of fenders and lines. 6 life jackets, EPIRB, Throw life ring, 2 fire extinguishers, 1st aid kit, torch, flares. Boat is shore power rigged, with 2 x battery chargers, 4 house, 2 engine, 2 bow thruster batteries, 1800 w sine wave inverter, 12 v lighting, remote spot light. Both Helms have Simrad Autopilot, Garmin chart plotter, Garmin Sounder and Garmin Radar, ICOM VHF. 2 boat mooring hooks, boat swim ladder, fishing rod holders, live bait tank, fish tables, Stainless BBQ, Summer flybridge kitchen with cold water sink with Fridge and ice maker. 3 swivel helm seats, helm lounge area, flybridge stairs. 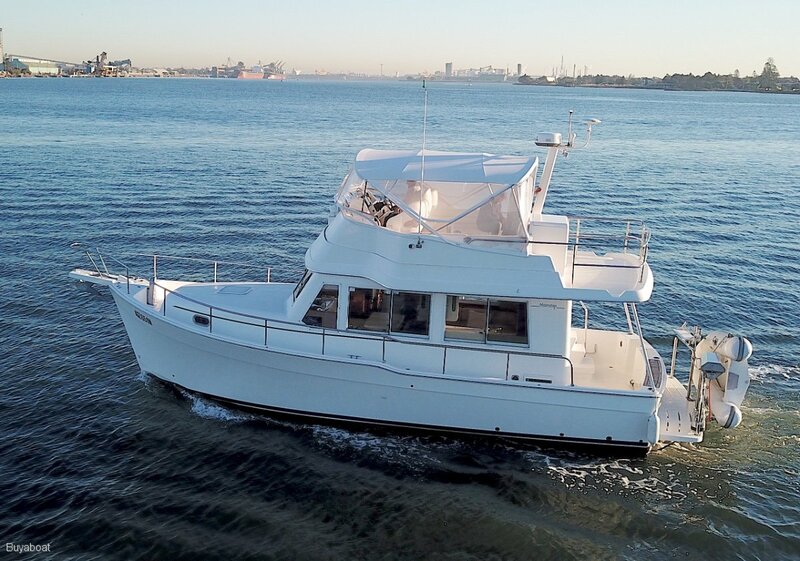 Wow a great boat, Comfortable, Economical, Safe and Classy, Modern boating with the classic Mainship trawler design. Call Glenn on 0414 988 273.